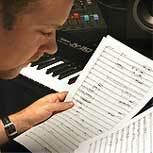 Patrick’s music covers many styles including orchestral, electronic, ambient, jazz and contemporary and he records evocative live and synthesized scores. His music supports and works for a film or program, delivering a quality soundtrack with any kind of instrumentation and historical or cultural setting. Patrick plays guitar, piano, keyboards, electric bass and percussion instruments. A documentary about the experiences of six survivors of the Holocaust. Theme song for the psychological thriller. The title sequence from William Farley's slice-of-life dramedy. Title sequence from the award winning financial series which played nationwide on PBS. Download - An exotic 30 sec commercial. Download - A clip from the spectacular TV documentary by Beyond Pix Communications. Patrick Bowsher composed, performed and mixed a beautifully evocative soundtrack for our made-for-TV documentary. We found him to be extremely creative, efficient and reliable... very pleasant to work with. Beyond Pix will definitely work with him again.